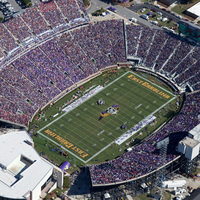 Dowdy-Ficklen Stadium is ECU’s on-campus football facility. 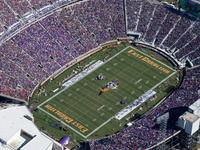 The official capacity of the stadium is over 50,000, making it the third-largest in North Carolina. The stadium is also the site of the Spring Commencement exercises for the university. It was pretty fun. I didn't stay for long, I got there early grabbed some nachos and ate them on the way to the inflatables, once there I jumped in the bouncy house and earned my ticket. Then I raced over to grab a Tshirt. Sense I wasn't interested in any of the other inflatables I went back to the underside of the bleachers and explored all the free stuff tables. Excellent event. I'm a DE student but being able to meet some fellow students that were even going to be in some of my DE classes was nice. I only got to meet one of my 5 professors as the others were not there, but my advisor was so it was still worth it! Great event.